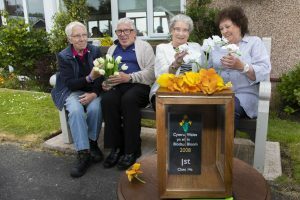 Cartrefi Conwy tenants’ flower power honoured | News by Wales Express News, People Before Profit! A group of green-fingered tenants have been honoured for their achievement in winning awards for their beautiful flower displays for 14 years in a row. The residents of the Park Way and Llys Parc sheltered housing complex in Rhos on Sea were presented with a special display case for their huge haul of trophies. As well as winning the 14 Colwyn in Bloom titles, they have also won awards from Wales in Bloom and Britain in Bloom. Cartrefi Conwy residents of Park Way , Rhos on Sea who have won Colwyn in Bloom for the last 12 years. and have commissioned the Men’s Shed to build a wooden box to hold one their trophies. Pictured are Margaret Richardson, Chair, Richard Blackwell, Vice chair, Eileen Jones, resident and Marion Weatherill, Secretary. But they’re not content to rest on their laurels and are aiming for even more floral glory in this year’s Colwyn in Bloom competition later this year. 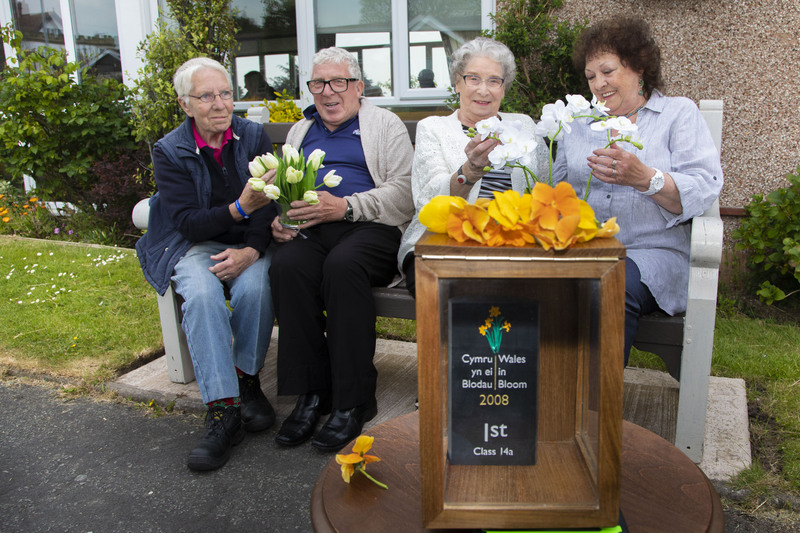 Their blooming marvellous record was praised by Nerys Veldhuizen, the older persons coordinator for housing association Cartrefi Conwy who manage the complex. And one proud lady has been involved with the estate’s garden committee since it launched 20 years ago. Eileen Jones was appointed warden at Park Way and Llys Parc in 1988 and also that year took on the role of chairperson of the gardening club. Eileen, 82 lost husband John 21 years ago. At first she and neighbour John Jones supervised the maintenance of nine gardens on the estate, carrying out the bulk of the work themselves, and the cultivation has grown from there. A celebration was held in the community centre on the estate to mark the garden committee’s continued success and the display box was made by the Men’s Shed project in Colwyn Bay. There are 48 bungalows and flats on the estate and Nerys says it is the beauty of the gardens which help make the homes so easy to let. “There is a big demand,” she said. Margaret Richardson, who took over as warden in 2000 and as chairperson of the garden committee in 2002, is quick to praise all the hard work Eileen put in to get it underway. As well as winning Colwyn in Bloom 14 years in a row, under Margaret’s stewardship the estate came first in the Sheltered Housing Category for Wales in Bloom in 2006 and 2007. In 2008 they came first in the sheltered category for the whole of Wales and ‘It’s ‘Your Neighbourhood Awards’ in 2004 and 2005. Margaret and vice chairperson Richard Blackwell, who joined the garden committee at Margaret’s request, fills the baskets on the walls of the community centre. “He holds the ladder and I fill the baskets,” says Margaret, 74. “We have just planted the baskets because everything has been delayed by the long winter – you should come back in four to six weeks! “We are very proud at what we have achieved. Jim Goodwin the judge for Wales in Bloom said it’s always lovely here but last year’s entry for 2017 was the best ever. Among other duties, vice chairperson Richard helps Margaret to maintain the flower beds in the front of the centre as well as the raised bed at the rear. Garden committee secretary Marion Weatherill is a relative newcomer to Park Way and Llys Parc – she’s only lived on the estate for four years. “Tenants, most in their 70s and 80’s look after their gardens religiously,” she said. “The winter has been relentless. Bedding plants have died and have had to be replaced. Nerys Veldhuizen said: “The celebration is to acknowledge the amazing work done in your gardens. Tenant Don Jackson, a regular contributor to garden committee funds, ended the ceremony by handing over a £50 donation. Judges in one of the RHS It’s Your Neighbourhood Awards said the tenants front gardens differ from property to property. “Residents cultivate their own front and back gardens. Residents are keen on green issues.